Ms Tan Shu Lin, 40, says her father's thriftiness and frugality have been her main inspiration in life and business. This attitude has kept her grounded and rooted - especially in terms of her investments. She has a keen interest in property that she inherited from both her parents, who did well out of queueing overnight at condo launches. "My mum and dad would make sure they were among the first few in line for a new condo project. They would get a queue ticket and sell it to willing buyers who weren't prepared to put in the hours," she recalls. "They sold some of these tickets - which determine whether you can pick a unit of your choice - for $10,000 or $20,000 each!" Such stories stuck with her and made her realise how much stock Singaporeans put in owning private property. But she was also intrigued with commercial property and wanted to build a career for herself in the management of real estate. Ms Tan was recently appointed chief executive of OUE Commercial Real Estate Investment Trust (Reit), which launched its initial public offering last Friday. Beyond awakening her interest in property, she credits her father with helping to teach her the value of money. "Shopping at the supermarket was quite a big deal in my younger days. Usually, we would buy groceries at the provision shop instead," she says. "When we got to the supermarket, my siblings and I would grab our favourite chocolates and biscuits and put them in the trolley as we walked down the tidbits and snacks aisle. "My dad would then take them out as he felt they were unnecessary." She remembers that when it was time to buy books for the new school year, her father would pay for all the course materials, but leave out the extra stationery she wanted to buy. 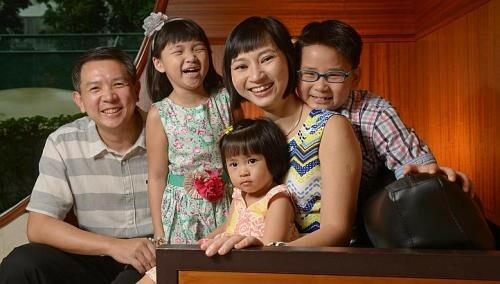 This emphasis on spending only on what was necessary eventually rubbed off on Ms Tan, and has guided the way she raises her own children, aged two, six and nine. I save about 20 per cent to 30 per cent of my salary every month. I take a need-versus-want approach when it comes to spending on food and groceries and other items. On average, about $2,000 to $3,000 across two to three credit cards. I don't carry too many cards in case I forget to pay the bills on time. But I do have one card that I keep because it helps me accumulate air miles. My father is in the insurance line, so I took out a life insurance policy, an endowment policy and medical insurance. As for equities, I'm a believer in Reits and I've invested quite a bit in this sector. My preference is for industrial and commercial Reits with strong sponsors. Ideally, the sponsors should have a pipeline of assets that can be injected into the Reit at an appropriate time. I'm the youngest of four siblings and we had a comfortable life. My father was the sole breadwinner and worked as an insurance agent for nearly six decades. He is a very frugal man and always reminded us to watch our spending and track our expenses. He had to spend his money wisely - his father died when he was two years old. But he always made sure I had enough pocket money, so I didn't have to take on additional part-time jobs. The TV at home would always be tuned to the now-defunct Teletext page because my dad would check the prices of his stocks whenever possible. He always adopted a buy-and-hold approach to investing and would put his money into blue chips. So I was always exposed to shares and put my own money in after I started working. None at the moment. My husband and I sold our 2,200 sq ft terraced house in 2012 before further property cooling measures were implemented. We are now renting a condo unit as it has facilities for the children. We are waiting for the market to cool a little more. My first car, which I bought in 2001 - a 1.4-litre Peugeot 206 that cost $80,000. My dad had suggested that I get a second-hand Honda City instead, which would have been about half the price. But eventually I went with my choice, and I still keep a toy replica of the Peugeot today. My dad retired from his full-time job last year, when he was 80. With three growing children, I hope to take a leaf out of his book and work for as long as I can. It's also important to keep your mind active. A four-bedder, 3,300 sq ft apartment in Bukit Timah, where I have lived with my husband and children since August 2012. A Lexus IS that I bought in 2008. But when I'm in the city, I usually travel by MRT instead.